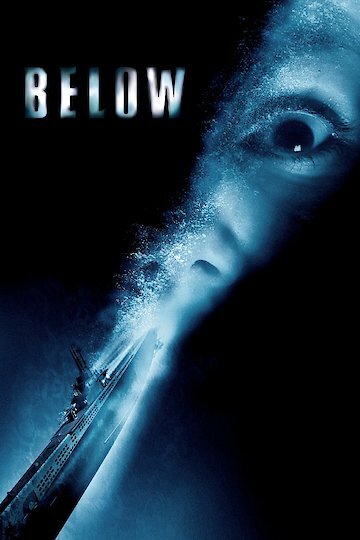 "Six hundred feet beneath the surface terror runs deep"
"Below" is a World War II horror film about strange happenings on a submarine after it picks up three survivors who were adrift. Problems keep happening on the submarine and crewmen think it is something supernatural causing all the problems. However, it is found out that it is officers causing the problems. In the end only five people survive. The film stars Bruce Greenwood (Lieutenant Brice), Matthew Davis (Ensign Douglas Odell), Olivia Williams (Claire Paige), Holt McCallany (Lieutenant Paul Loomis), Scott Foley (Junior Grade Steven Coors), and Zach Galifianakis ("Weird" Wally). The film was written by Lucas Sussman, Darren Aronofsky, and David Twohy; Twohy also directed the film. The movie was released in 2002. Dimension Films and Protozoa Pictures produced the film. The film was distributed by Mirimax films and Dimension Films. The running time of the film is 105 minutes long. While at the box office the film made $605,562. Below is currently available to watch and stream, buy on demand at Amazon, Vudu, Google Play, iTunes, YouTube VOD online.